The new version 2.2.3 of ApPHP Restaurant Site has been released and available now for downloading. There are many improvements and new features, like: menu footer text, catering management from Backend, changes in core of the script etc. This version has 2 installation options: new and update for previous version. All recent changes can be viewed here. 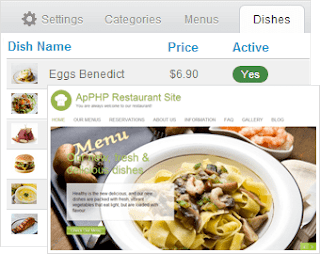 ApPHP Restaurant Site is restaurant menu website and site management online solution for restaurant or food related services. This is a fully featured PHP restaurant script. It allows you to start your online restaurant business or upgrade your existing in minutes. This script is fully dedicated software solution with all the required features for restaurant business and gives you possibility to keep restaurant menus on your website up-to-date with easy. Creating a restaurant's online menu is very easy with ApPHP Restaurant Site script. You can add, update and maintain the dishes, prices and details as well as sort them how you want. Also you can create as many menus, categories, and menu items as you need.